After nearly 8 years of waiting, the USPTO has granted Apple a patent which aims to protect their iTunes Store interface. The patent covers the look and feel of the store, including how users browse, search for and purchase content through iTunes. Or, as Apple puts it, "Graphical user interface for browsing, searching and presenting media items". Improved graphical user interfaces suitable for reviewing, browsing, previewing and/or purchasing media items are also disclosed. The graphical user interfaces are suitable for reviewing or browsing numerous media items. The graphical user interfaces are also suitable for previewing or purchasing media items in an on-line manner. The graphical user interfaces are particularly useful for a system that provides purchase and distribution of media in a client-server environment. 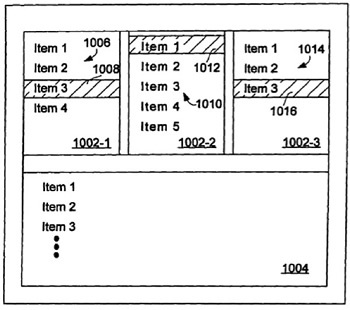 Although seemingly broad, the patent keeps its focus narrowed on the iTunes GUI. Filed in 2004, patent 8,161,411 still refers to Apple's media sales gateway as the iTunes Music Store. At this time, Apple hadn't yet started selling videos, books or apps and the iTunes Music Store housed only 200,000 songs instead of 20 million, the amount its vast library contains today. In fact, the music-centric market place didn't get the name "iTunes Music Store" until 2003, a year before the patent was filed. It is also interesting to note that Apple was being publicly traded at $25 per share in 2004 instead of $610. This is at a time when the company was nowhere close to becoming a trillion-dollar business and just several years prior, Apple had even flirted with bankruptcy. Say what you will about iTunes' interface, but since this patent was first applied for, iTunes has become nearly ubiquitous following the prolific adoption of iPhones, iPads and iPods during the past 4 years. Perhaps surprisingly, it has barely changed at all over the past 8 years. However, later this year, the company is expected to completely redesign the iTunes Store. The overhaul aims to make the store friendlier and easier to use, which may actually invalidate the company's long-awaited patent.